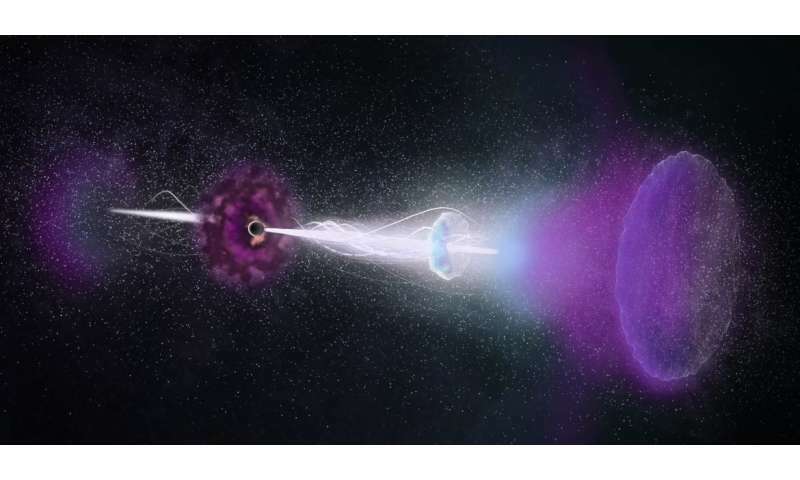 While the gamma rays from the burst disappeared from view a scant seven seconds later, longer wavelengths of light from the explosion—including X-ray, visible light, and radio—continued to shine for weeks. This allowed astronomers to study the aftermath of this fantastically energetic event, known as GRB 161219B, with many ground-based observatories, including the National Science Foundation's Very Large Array. "What was unique about this event," Laskar adds, "is that as the reverse shock entered the jet, it slowly but continuously transferred the jet's energy into the forward-moving blast wave, causing the X-ray and visible light to fade much slower than expected. Astronomers have always puzzled where this extra energy in the blast wave comes from. Thanks to ALMA, we know this energy—up to 85 percent of the total in the case of GRB 161219B—is hidden in slow-moving material within the jet itself."